Remember to let Laura know at 435-8729 if you are interested in going. There are a limited number of rooms available so it is important to get your name in early. The annual Gorham Ride-In is a social event the club holds annually at the Town & Country Motor Inn in Gorham, NH. Club members come up with a theme for the event and decorate rooms and the area we gather in, "The Greenery Room". The Greenery Room is a private function room near the pool that the T&C allows us to use during our stay. Meals: Friday night we have our world famous pot luck dinner so be sure to bring your favorite dish to share. The last few years everyone has also been bringing something to share for breakfast on Saturday and Sunday mornings which works out very well and gets us on our machines faster! Saturday morning we have coffee and some breakfast items in the Greenery Room. Many people grab lunch along the trail. Saturday night most of us meet back at the T&C, some people head over to the restaurant at the T&C while others go to local restaurants in town or order delivery. Sunday morning we again meet up in the Greenery Room for coffee and breakfast. Riding: If the trails are decent (which they almost are) we ride right out of the T&C. Some people ride Friday prior to checking-in or after dinner. On Saturday we have different groups of riders that go different directions. Most groups head to a certain destination, some groups are faster riders, other groups are slower. Pick which group you want to ride with and go! Then Sunday is our big club ride before heading home. All members are encouraged to ride with us as a single group. We will head to a chosen destination and hopefully get in a group photo if the weather is decent. This event takes place the end of January or the beginning of February. The weekend for this event is commonly the Tri-State Reciprocal Weekend! 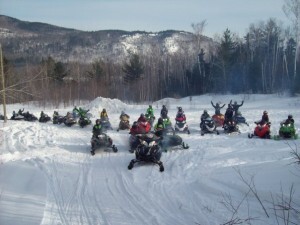 Legally registered snowmobiles can cross over into Vermont and Maine. Since the T&C is on the Maine border, some groups have chosen to ride there on Saturday. We do not always go on reciprocal weekend but we do aim for that date whenever possible. If you would like to attend this event you MUST contact Laura Foss at 603-435-8729 or lfoss@myfairpoint.net - Calling the T&C directly and booking a room has caused many headaches in the past, including rooms that got double-booked so PLEASE go through Laura! IMPORTANT: Once you commit to going to this event please do NOT cancel unless its an emergency! The club commits to a block of rooms so that other guests are not mixed in with the club members. If someone cancels then the room within our blocked rooms gets rented to someone not with SVSR, since we are not exactly a "quiet" group this can be a problem. We attend this event regardless of weather or trail conditions.